Hosting a Splintered read-along was probably one of the best decisions I've made this year. I'd been lusting for it, what with the beautiful cover, and I just couldn't wait to read it. And now, after a few months, I've been given the opportunity to be apart of Krazy Book Lady's ARC tour of Unhinged and I am a happy book blogger. Soooo, Alyssa bothers in the aspect that she's always doubting her childhood friend Morpheus. This also could be due to the fact that I'm Team Morpheus all the way, but Al's manner in the way that she treats Morpheus has always bothered me. However, she is such a dynamic character. Being in her position, I wouldn't know what world I belonged to either. Save a bunch of crazies in this unfamiliar land or save the lives of those you know and consider normal? So, I mean, I have to give her some credit and having half the mind for doubting an inhabitant of Wonderland, but I still think she acted a little poorly. WOAH. I have to say that this was a great sequel to Splintered. I have to admit that I had no idea where the author could have brought the next book. All I knew was that I wanted another. The plot thickens when Alyssa has to decide which world to save and be a part of. Troubles definitely get more troublesome when some certain characters *ahem* Red *ahem* just won't go away. So I loved the growing relationships between Alyssa and her mom and Alyssa and Morpheus. We really didn't get to know Alyssa's mom very well in the first book and, in this one, readers get an inside look at the not-crazy mother. And I cannot tell you how much I was swooning over Morpheus in this book. You're perfect, moth boy! One thing that really distinguishes A. G Howard from other authors out there in the world is her writing. Beautifully vivid and dark. Her original spin on a favorite fairytale of mine and her incredible writing made the perfect recipe for me. I always feel like I'm being transported into Alyssa's story once I open her books. Sometimes I feel like I'm missing that originality in pieces nowadays, sadly. Unhinged was a great addition to the Splintered series and I absolutely cannot wait for the next one. I am totally flipping out over that ending! And if you've not read Splintered yet, I highly suggest you do. With gorgeously descriptive writing, a dark mood, a fast pace, a twisty plot, and Morpheus, it'll make a great read for anyone. 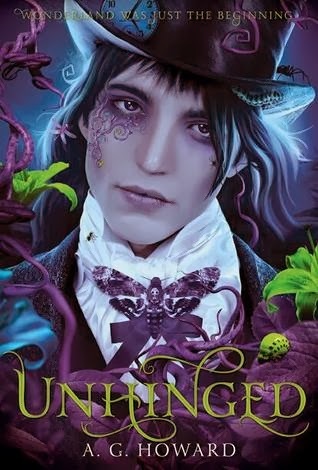 I'm so excited to read Unhinged! I really enjoyed Splintered and can't wait to read where these characters go next. I've been hearing so many great things about Unhinged lately. Happy to hear that the sequel is great. Great review! I LOVED, LOVED Splintered! I even pre-ordered this one! I can't wait! in 10 days!!! YAY!! !